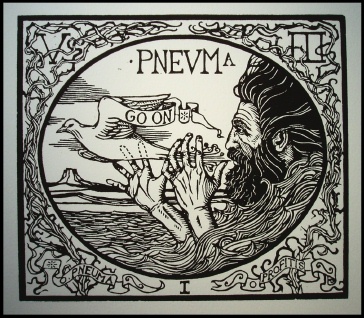 Go On, John the Baptist, (6×7″) is a new lino-cut edition literally “hot off the press” which in this case happens to be a wooden spoon with a broken handle. You can see an enlarged version of this print via its thumbnail on the printmaking page. The edition, which I am actually still in the process of printing, will consist of 30 prints, which will be for sale for $75.00 for each print. Contact me at playbanjo@gmail.com if you are interested in purchasing a print. Since these prints are hand-printed there are slight differences between each print.